Sculpture City Saint Louis 2014 was a year-long initiative to draw attention to the presence sculpture has in the landscape of the St. Louis region. Led by Laumeier Sculpture Park in collaboration with regional arts organizations, it brought new ideas to the interpretation and understanding of the works that adorn and define the community. Organized as part of this initiative was Monument/Anti-Monument, an international conference for artists, historians, curators, architects and other experts to share global perspectives on sculpture and its relationship to place. We created the graphic system for both the year-long initiative and related conference, including a website, conference program, advertisements, posters, postcards, monthly newsletters and film credits. 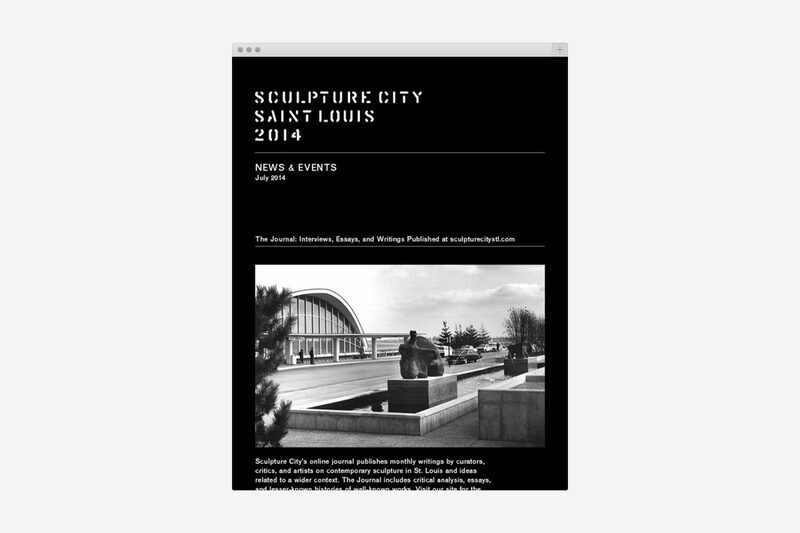 In response to the conference’s inaugural theme, Monument/Anti-Monument, the inverse of St. Louis’ most iconic sculpture, the Arch, was used across posters, stickers and totes distributed at sculpture-related events and exhibitions throughout the city. Originally intended to end at the end of 2014, the success of the program and a growing response from those within the field helped secure funding to continue the Sculpture City initiative as a long-term community project.